I’m a laugh addict. Movies, TV, books, people (not usually at them, more like, if they make me laugh), to be honest, I’m even satisfied with smiling. I have the laugh lines to prove it. Which brings me to Mel Brooks, bad man having contributed to these aforementioned lines. 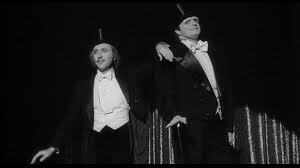 One of the worst offenders is still Young Frankenstein starring Gene Wilder (whom I wished to marry when this movie came out, now I’d go for friendship). You’d think after all these years I’d get tired of it yet I don’t. It’s impossible to explain how hilarious this doting spoof on Mary Shelley’s classic, Frankenstein is, but I’m chuckling even as I type. As time marches on, 40 years later, watching this has become bittersweet with the passing of so much of its brilliant cast. Props created by Kenneth Strickfaden for the 1931 film Frankenstein were used as most of the lab equipment in this film. The ‘Walk This Way’ gag in the movie was the inspiration for Aerosmith’s hit, Walk This Way. 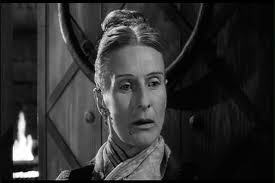 Cloris Leachman improvised a scene in which Frau Blücher (add horse whinnying here) offers “varm milk” and Ovaltine to Dr. Frankenstein/Fronkensteen. Gene Wilder came up with the idea for YF and pitched it Brooks while filming Blazing Saddles. Wilder fought Brooks to keep the “Puttin’ On The Ritz” (written by Irving Berlin, made famous by Fred Astaire) bit in; thank goodness he won. 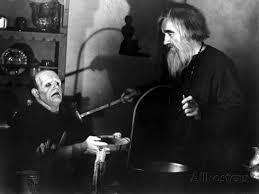 Young Frankenstein was not only filmed in black and white for effect, Brooks used unusual techniques like iris outs, wipes, fades to black, and old-fashioned opening credits. As a gag, Marty Feldman furtively moved his character’s hump from shoulder to shoulder to see if anyone would notice so they added it to the film with lines like, “Didn’t you used to have that on the other side?”, and “What hump?”. 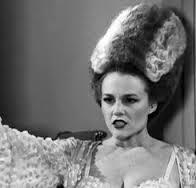 Madeline Kahn, Marty Feldman, and Peter Boyle also starred in the mind-numbingly funny Yellowbeard with the astonishing Graham Chapman. 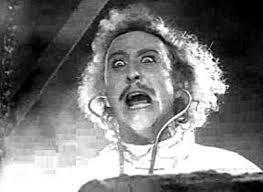 Gene Wilder always had trouble not laughing during scenes. I understand. We love that movie! 🙂 My kids watched even before they understood the sexual overtones. Love this movie!! Like, I make my son sit down and watch it with me and I totally crack up throughout the entire movie!!! What a great movie. Even after all these years I still love it! So much love for this movie! Watched it far too many times when I should have been working on my thesis…Oops!